Falkreath is situated near the southern border, near the city-state of Elinhir in Hammerfell. The pine forest that surrounds Falkreath is vast, covering a large part of Falkreath Hold. In the city's general vicinity are ancient Nordic ruins and abandoned towers that have been used by the local bandits as redoubts. The Shriekwind Bastion overlooks the entire city, while the Falkreath Watchtower protects the settlement from northern invaders. In the Second Era, Falkreath was a walled city, but now only minor fortifications remain, making up the east and west gates. The original Hall of the Dead was buried underground, but later another one was built in form of a typical Nordic home in the graveyard. 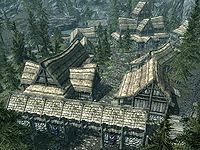 The Jarl's longhouse was once located atop a hillock that overlooked the city, but a new one was built in the center of the town, along the road crossing Falkreath. Falkreath is neighbored by several settlements, including North Keep in the north, and Neugrad Watch in the northeast. The city-state of Falkreath was founded many years ago, by the warrior Bjarfrud Skjoralmor, who had cut down the trees of the pine forest and established Falkreath. Afterwards, he became the city's first Jarl. From then on, his lineage would rule out of Falkreath, all the way into the Second Era. But sometime before 2E 437, the Orcs under the command of Yashnag gro-Yazgu had taken control of Western Falkreath Hold, posing a threat not only to the city-state of Falkreath, but the sovereignty of the whole Western Skyrim. The Jarl of Falkreath was slain by Yashnag, leaving the hold to his son, Hakkvild. Yashnag's orcs continued to be a serious threat for Jarl Hakkvild, forcing the young jarl to take to arms and challenge the Orc chieftain in an ancient ritual. In the end, Yashnag was slain by Jarl Hakkvild, who took the name "Yashnag-Slayer" after his victory. With their leader dead, the Orcs fled back into Wrothgar, and Hakkvild reclaimed all of Falkreath. Years later, Kurog gro-Bagrakh's Orcs attempted to reclaim the land that used to belong to Yashnag, but this time the Nords were able to defend themselves and repel the invaders. During the Interregnum, the city-state of Falkreath was ruled by Hjurgol Skjoralmor, who eventually lost the favor of his people when his wife had passed away, thus becoming an alcoholic and careless leader. But sometime around 2E 583, Falkreath was attacked by the Dreadhorn Clan of the Reachmen allied with Minotaurs. The Jarl barricaded himself in his hall, letting his soldiers and his daughter, Thane Eerika Skjoralmor, handle the situation. But when things grew out of control, Thane Eerika was forced to call upon the Undaunted to break the siege and secure the people out of Falkreath. The Minotaur Domihaus the Bloody-Horned led the siege of Falkreath. Before Jarl Hjurgol could escape, he was trampled by Domihaus, who had crashed into the Jarl's Hall above the city. Eventually, the Minotaur Lord was killed by the Undaunted, thus breaking the siege of Falkreath. In the aftermath, Thane Eerika proclaimed herself the new Jarl of Falkreath. Many years later, the city-state of Falkreath, by then considered a part of western Cyrodiil, was ruled by Cuhlecain, one of the petty kings of the Colovian Estates. King Cuhlecain's ambition was to unite the Kings of the Colovian Estates, but he needed to secure the northern border in the Reach, near Old Hroldan, a mountain stronghold of the Reachmen. With his prized general, Hjalti Early-Beard, the walls of Old Hroldan were broken, and Cuhlecain united West Cyrodiil under a single banner. Eventually, their group expanded into Nibenay and the Imperial City. After Cuhlecain's death, Hjalti, now under the name of Tiber Septim, brought about the Third Empire. During the Imperial Simulacrum, the city-state of Falcrenth was ruled by King Bjeld. As time went on, in 4E 201, Jarl Siddgeir inherited the throne of Falkreath from his uncle, Dengeir of Stuhn. At this point, Dengeir had grown rather senile and unsuitable to rule over Falkreath Hold, although Siddgeir was not any better. Young Siddgeir was aloof and enjoyed the benefits of being a Jarl, rather than actually committing to the role of the leader. His steward, Nenya, handled all the affairs, having experience serving Dengeir and the Jarls before him. At this time, the Skyrim Civil War raged all across the province, dividing the land politically into Stormcloak-controlled east and Imperial-controlled west. Jarl Siddgeir was loyal to the Imperial Legion and the Third Empire, albeit he saw it as an opportunity, instead of actual loyalty. His uncle, however, greatly supported the Stormcloaks, spouting conspiracies about how the Empire dethroned him for his devotion to them. This page was last modified on 15 December 2018, at 20:11.